We are engaged in manufacturing, supplying and exporting a wide assortment of Calibration Gas Mixture to our valued patrons. These gas mixtures are prepared using good quality compounds. We prepare these under qualitative laboratory conditions as per international quality standards. Offered products comprises Ammonia Calibration Gas Mixture, Hydrogen Calibration Gas Mixture, Argon Calibration Gas Mixture and others. Calibration Gas Mixture - more emphatically a degree of measurement is our prime product For production. Gravimetric filling method as per ISO 6142 is followed. For analysis, various G.C methods as per ISO and ASTM standards and direct analyzers are used in the laboratory maintained as per ISO 17025. For Certification - ISO 6141, ISO 6143 and ISO 6976 are being followed. * CO-0.3% + CH4-0.3% + Ar-10% + O2-25% + N2 Balance. 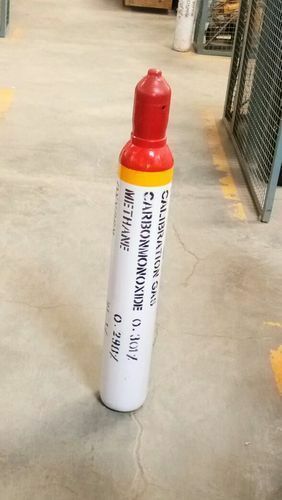 Looking for “Calibration Gas Mixture”?